The final game of the day saw Orchard Hill face off against a Travieso team that hadn’t quite hit their stride yet as a new team. However, after two games Travieso seemed to be working better as a team early on as they dominated open play in the first half, shooting at goal 11 times to Orchard Hill’s 3 shot attempts. Travieso was only able to put 3 of those 11 shots through the goal with Sebastian Merlos scoring two, and Mariano Gonzalez adding one. Gonzalez converted both his penalty attempts to bring his season percentage over 75% as Travieso took advantage of the few Orchard Hill fouls throughout the game. Facundo Pieres led the way for Orchard Hill but couldn’t convert any of his penalty 4 attempts, a rare outcome for the season-leading 80% penalty shooter. 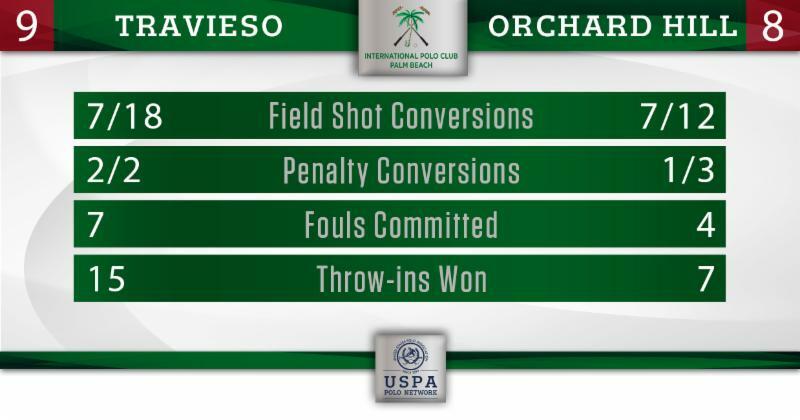 Travieso held Orchard Hill scoreless in the second and third chukkers to take a 5-2 lead into halftime, with Merlos pushing the team forward and Alfredo Capella playing extremely strong in the back, consistently picking up the ball and moving it back downfield. 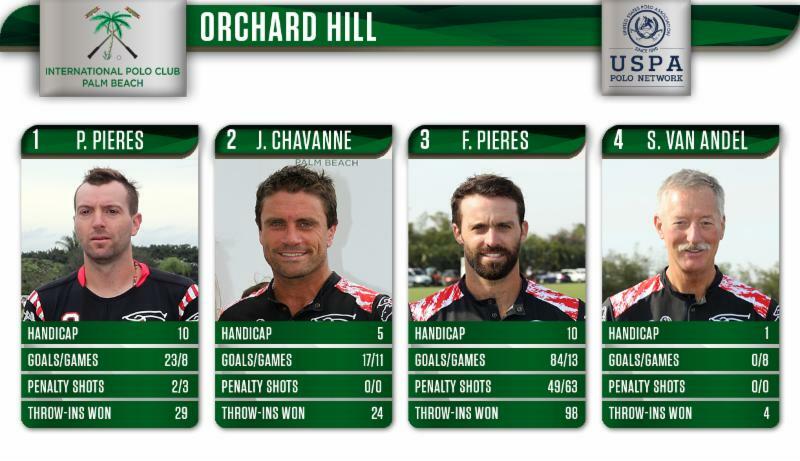 Orchard Hill began their comeback led by Facundo Pieres scoring his second and third goals of the game, with Juan Chavanne finishing off a slick pass for his first goal of the game. Just as Flexjet beat Valiente by keeping Cavanagh off the line, Travieso avoided fouling and only provided Facundo Pieres with 3 penalty attempts for the whole game—a key factor if a team wants to beat Orchard Hill. 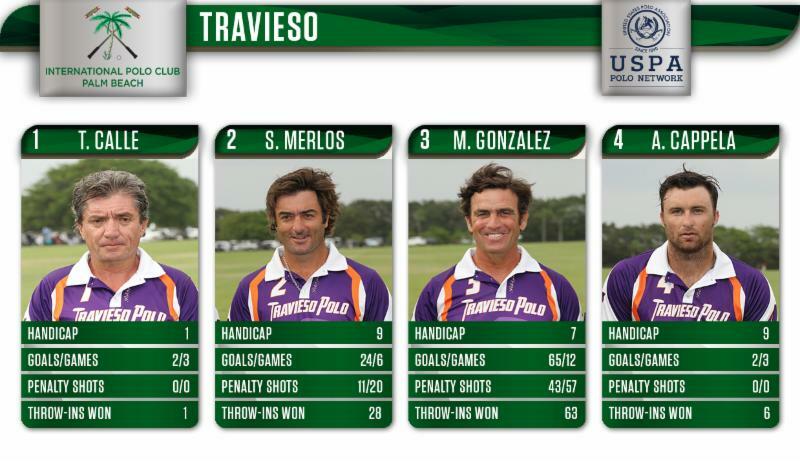 The combination of Merlos and Gonzalez, who together made 15 shots at goal and 7 goals from the field as, propelled Travieso to extend their lead after the fifth chukker to 9-6. 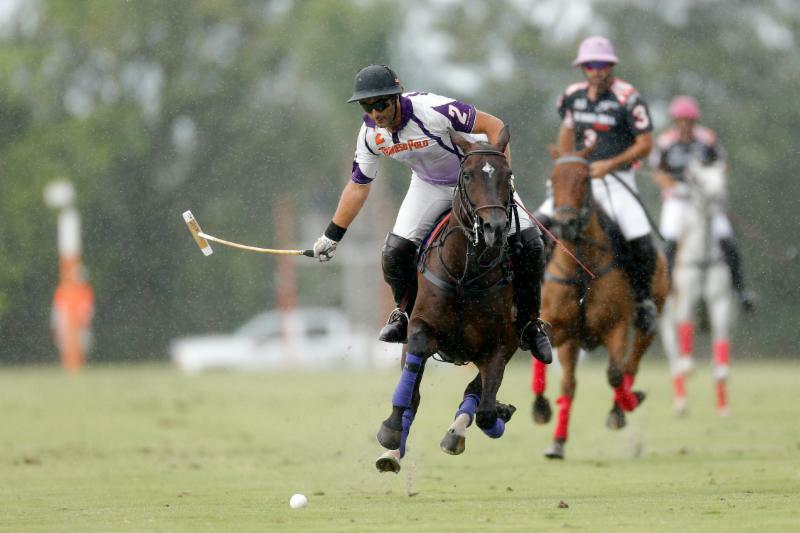 Facundo Pieres tried his best to get Orchard Hill back in the game, scoring back-to-back goals to get his team within 1. But Travieso continued to play a strong game, constantly pressuring Polito Pieres on the ball throughout the second half and never quite letting him break away for any individual runs. Travieso held on for the 9-8 victory. That set up a four-way tie for third place in the standings, with all four teams having a 1-2 record, which will be resolved by a penalty shootout. The tournament continues Sunday, April 16 with the mini-quarterfinals at noon and 3 p.m.
All games in the U.S. Open are being live streamed by the USPA Polo Network: uspolo.org.